Discussion in 'Firearms and Hunting' started by Xenamnes, Mar 22, 2019. Since there is no section for the discussion of firearms outside of matters of politics, it is necessary to improvise on such. For those that collect firearms simply to have them, what other everyday items are also collected? Any firearm that has been politicized and classified as regulated or illegal is a collectable. Besides firearms, I collect coins, and guitars. My one time large gun collection was the product of accumulating tools for the hunting business I once had along with historic guns of interest. I also had nearly 100 custom art knives, the majority art folders and auto, many of mine of which appeared in David Darom’s books. My knive collection was probably worth more than my gun collection, pieces ranging from $1,000 to $10,000. Not your EDC type knives. Been thinking of picking up a ww2 luger or PPK. I wonder what happened to all of the P-08 Lugers that found their way to America after the Second World War ? There was always more than a few homes on every block that had a Luger in the dresser drawer. During the 50's and 60's gun shops were full of Lugers for sale. The P-08 Luger is one of the few pistols that are natural aim pistols. America has the .45 Colt Peacemaker and the .45 ACP M-1911 A1 pistol. Germany has its P-08 Luger. Love the look of those Lugers. Heel release like the Makarov, and the same grip angle seen in the Ruger .22 pistol. There were .45 caliber Lugers made before we adopted the 1911. Though the guy who owned the website "World War ll Gyrene" passed away a few years ago, the website only exist on the WayBack Machine. The phrase "every Marine a rifleman" is more than just empty words. Marines have always taken pride in their proficiency with the service rifle. For most of World War II, the M1 rifle was the basic weapon of the infantry Marine. This rifle was adopted as standard by the Marine Corps on 5 November 1941, although the M1903 Springfield rifle continued in use in various roles throughout the war. In November 1940 the Marine Corps conducted a competitive trial of the M1, M1903, the Johnson and Winchester rifles. This test was carried out at Marine Corps Base, San Diego by 40 experienced Marines who had recently qualified as expert riflemen or sharpshooters. LtCol "Red Mike" Edson, among the best shooters in the Corps, was one of the senior officers assigned to the test board. Over 12,000 rounds were fired during four weeks of shooting. At various phases, the test rifles were submerged in salt water, packed with mud, sprayed with fresh water to simulate rain, sprinkled with sand and exposed to heavy dust. They were also evaluated for ease of maintenance, infantry drill, and firing with fixed bayonets. The test board concluded with the following evaluation: "It became increasingly evident as the tests progressed that the M1 rifle was superior to the other semi-automatic rifles. 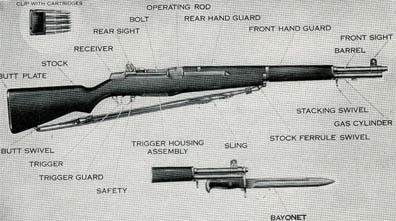 Although it failed on some of the abuse tests, it was in general much more reliable in mechanical operation, in ruggedness, and in freedom from repairs than either the Johnson or Winchester rifles… The Marine Corps feels that its tests conclusively proved that the M1 rifle is the most satisfactory semi-automatic rifle available." In November 1941, the Marine Corps classified the M1 as the standard service rifle. Marines resisted the M1 at first because they had used the Springfield rifle for almost 30 years. The Springfield was held in high regard because of its long range accuracy and reliable functioning under the harshest battlefield conditions. Throughout World War II the Army Ordnance Department was responsible for acquiring small arms for both the Army and Marine Corps. It was not until after the end of the campaign for Gauadalcanal that sufficient M1s became available to equip all front line Marine units with this rifle. The M1 gave the Marine rifleman superior firepower against his Japanese opponent. It was dependable and easy to maintain in the field. An M1-equipped Marine rifle platoon could sustain the same volume of fire as a company armed with bolt-action rifles. Operation of the M1 was simple. Ammunition was loaded via an eight round clip into the top of the receiver. When the rifleman fired his last round, the bolt locked to the rear and the empty clip ejected with a distinctive ping sound. To reload, the rifleman simply pushed a loaded clip into the top of the receiver. Once the clip was fully inserted, it would unlock the bolt, which stripped off the first round to load in the chamber. A common problem experienced by new shooters was "M1 thumb." This occurred when the rifleman failed to quickly remove his thumb off the clip as he was loading. When the bolt unlocked, it could smash his thumb against the front of the ejection port. This only happened once for most new shooters. The excellent sights on the M1 went on to be used in the M1/2 carbine, M14, and M16. Another nice thing is the integral magazine. It allows the shooter to stay low, and also keeps debris from entering. I have a 1943 dated Mosin Nagant M91-30. That thing is a primitive beast. Can't imagine WW2 urban warfare with a long, stiff bolt action. The M1 was a far superior weapon. My predilections run to collecting custom revolvers; specifically ones tuned for serious self-defense applications. "Fighting sixguns" as my grandfather liked to call them. The Fitz is nice. How to they shoot? What is that small tab on the back of the trigger? What purpose does it serve by being there? Looks like a Trigger Stop of the type they had in the 80’s. The pics were ones I pulled up to illustrate the types I mean. I'd love a Fitz; that particular one belonged to an instructor of mine, and I got to shoot it. Very smooth and surprisingly accurate. It's called a trigger stop. It's meant to stop the trigger travel at the moment the sear trips, so that subsequent trigger movement won't disturb slight alignment, and enhance accuracy. 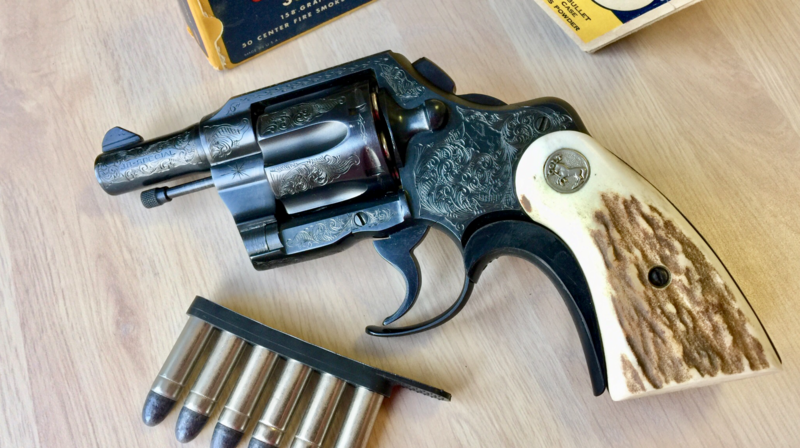 Here's an example from my personal collection; not built on a Colt New Service or Police Positive like most Fitz guns, this one's built on a S&W M58 .41 Magnum that belonged to a former San Francisco police officer. Barrel shortened to 2.5 inches, hammer spur bobbed, trigger guard slimmed at the front (instead of cut away like on a Fitz), grip frame round-butted, trigger polished; then the whole thing finished in Metaloy. I have a 1934 Mosin Nagant. It is fun, and very cheap. My next weapon will be a M1 Garand via Civilian Marksmanship Program (CMP).